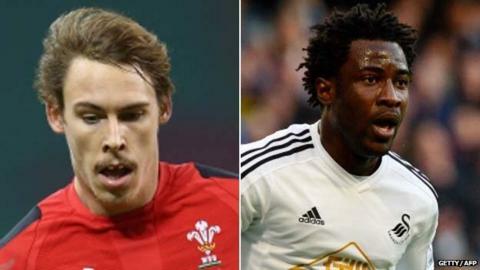 Liam Williams did not mean "offence" posting a picture of himself "blacked-up" as Swansea City's Wilfried Bony says former Wales captain Phil Davies. The photo on Twitter has been removed by Wales rugby star Williams, who has apologised saying there was "no malice behind it" and he is not a racist. Davies said the incident "highlights" player "responsibilities". "Players have to make sure when they post things on social media, it's appropriate and doesn't cause offence." He added: "I'm sure Liam certainly didn't mean to do that." Scarlets full-back Williams, appeared with four teammates in fancy dress where he posed as Swansea City striker Bony, an Ivory Coast international who scored two goals at the 2014 World Cup. The 23-year-old was criticised by Show Racism the Red Card, which said it was "disappointed to see the image". Speaking on BBC Sport Wales' Scrum V programme, former Cardiff Blues coach Davies said: "Liam's a pretty jovial character. He's a young man but it just highlights again the responsibilities professional players have. "They have responsibilities and I think in the main they do deliver." A statement from the Scarlets said: "Scarlets is fully committed to eradicating discrimination and promoting equality for both staff and our customers by treating people fairly and according to their needs. "Scarlets is proud of its record in promoting equality and non-discriminatory behaviour amongst all our employees and this applies to the way we behave to members of the public and to other employees."